Leader of Lancashire County Council Jennifer Mein visited Nelson and Colne College to meet a group of young people who have just completed a ground-breaking programme called Digital Advantage. Digital Advantage is a Pop-Up Digital Agency which offers 16 to 18-year-olds 24 hours of work experience and training in specialist, practical digital skills with a further 24 hours of guided support. It is delivered by The White Room and supported by Digital Lancashire. Participants get help to develop and plan their own digital business start-up. In the style of the BBC’s Dragons Den, they will pitch their digital product or service to an industry panel, with the best winning a £2,000 prize to support starting up a business. Commenting on the visit, Jennifer Mein said: “It was inspiring to meet these young people and hear about how Digital Advantage has helped to give them the skills they need to thrive in today’s digital economy. Digital Advantage is a pilot project launched in Lancashire – as part of an innovative strategy to fuel growth in the county’s multi-million pound creative and digital economy. Digital Advantage is offering over 200 young people the kind of digital skills which are rarely taught in local schools and colleges but are highly-prized by local employers. 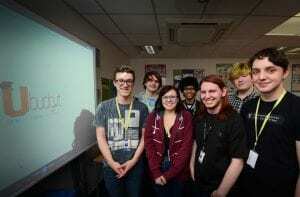 Morag Davis, Head of Creative and Digital at Nelson and Colne College, said: “We feel privileged to have taken part in this pioneering programme which is designed to equip Lancashire’s future stars with the vital skills needed to succeed in an increasingly digital landscape. Simon Calderbank, from Big Knows, who has been working with the NCC students, said: “The power of this programme, aside from equipping the students with the required digital skills that loyal employers are crying out for, is its ability to empower them to truly showcase their potential in a realistic digital agency space. In addition to Nelson, the Lancashire Enterprise Partnership is also funding Digital Advantage in schools and colleges in Blackburn, Blackpool, Burnley, Chorley, Haslingden, Morecambe, Preston, Leyland and Skelmersdale. xperts from across the creative and digital sector in Lancashire are now being asked to lend their support through masterclasses, mentoring, sponsorship and to offer the Digital Advantage graduates job interviews for new apprentice positions. Yet 57% of fast-growing businesses in a recent survey said they struggled to find technically capable staff with advanced IT or software skills. Provision of computer sciences at higher-education level also lags behind the national average. The Lancashire Enterprise Partnership (LEP) is investing in addressing this digital skills gap as part of its ambitious and comprehensive strategy to transform Lancashire’s economy over the next decade, creating 50,000 new jobs and driving economic growth. Altogether, the LEP has invested £30m of capital to create hundreds of new training places in cutting-edge centres in order to provide the skilled workforce that employers in seven key economic sectors – such as the creative and digital economy – say they need for business growth. Lisa Moizer, the LEP’s Skills and Employment Hub Manager, said: “We already have many world class digital businesses here in Lancashire and there is huge growth potential in the sector. “The pace of technological change makes it difficult for schools and colleges to keep up-to-date, so there aren’t enough people leaving education with the digital skills employers need. “We are creating a pipeline of students and graduates with cutting-edge creative and digital skills and, at the same time, improving their employability and life chances. This a tremendously exciting time. Thanks to the LEP’s investment, we expect to see substantial growth in our digital and creative economy.